“It’s interesting where you go in a 40 year art career. I look back now and see that I have learned many different technical skills in oil painting, but what is most important is that I have learned the subtlety of catching a moment in time and portraying the beautiful complexity of that moment in nature, bringing a richness to it that is beyond our conscious, objective ability to describe… beyond our expectations. There is an art to choosing the scene or idea that is compelling enough to make the viewer pause and drink it in, not pass over it as something easily categorized. To see the reflections, the depth of images, the colors that are just a bit beyond everyday reality, and the selection of that scene which calls attention to the visual perfection found everywhere in nature. It is the still moment which hints at the wealth to be found in the backgrounds of our lives. 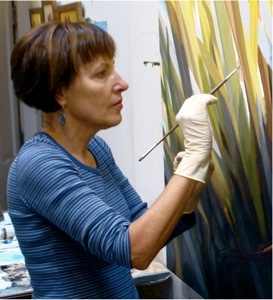 Elizabeth is also a member of: International Guild of Realism and Oil Painters of America.